Fermented beets, dank and earthy and sour, number among my favorite ferments of vegetable. While I will always love the fetid odor of a true sauerkraut, the clean and salty sharpness of Moroccan preserved lemons or the brackish must of a home-cured olive, it is fermented beets – lovingly spiced and brine-pickled – that makes me fall in love again with the lost art of true pickling. It wasn’t long ago, you see, that a pickle inherited its characteristic sour saltiness from a long and slow process of microbial action. This process – the purposeful introduction of bacteria into food – might be enough to make any public health worker cringe, but it is precisely that process of microbial action that shaped well-loved traditional foods across the globe, satisfying a dual need for enhanced nutrition and food preservation. Indeed, traditional societies across the globe practiced the sacred culinary art of fermentation, handing it down parent-to-child, for thousands of years prior to the advent of refrigeration and the rather quick industrialization of our food supply. West Africans fermented sorghum and millet into ogi. Pacific Islanders transformed the taro corm into poi while Asians and Europeans fermented beans, milk grains and vegetables into some of the favorite foods of today: miso, sourdough bread, yogurt – and, of course, pickles. Traditionally prepared, pickled beets were not seasoned with vinegar and sugar, but, rather, they acquired their sour flavor through a process of fermentation. 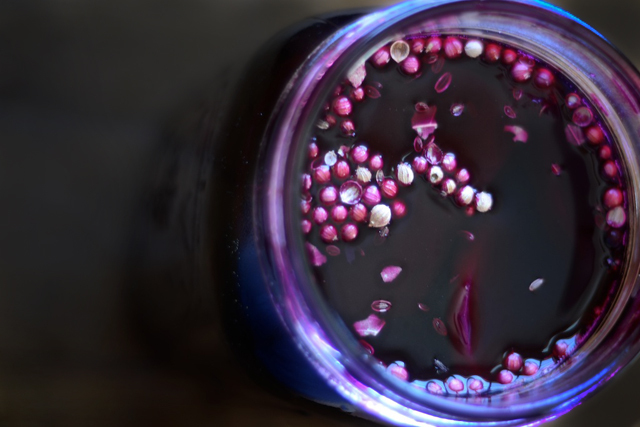 Fermented beets feature widely in the culinary traditions of eastern Europe where tonics like beet kvass and dishes like rossel not only celebrate the humble beet, but transform it, too. Fermentation extends the life of foods like beets; as beneficial bacteria consume the sugars naturally present in beets and other foods, they produce lactic and acetic acid which, like vinegar in modern pickles, preserves the beets for long-term storage. As an adjunct benefit, those same bacteria also produce vitamins, particularly folate and vitamin K2, and help to populate the gut with microbes that can boost the immune system. I tackle fermented beets in my traditional foods kitchen, from the tiny marble-sized Chioggias to the hefty blood-red beets the size, shape and heft of a man’s heart. We season them with caraway and salt or dill and mustard seed, but it is ginger and orange that can elevate the earthiness of beets from their dank origin to something sweeter, something lighter and more vibrant. And while many ferments of vegetables are produced through wild means, by crushing vegetable with salt and allowing the omnipresent beneficial bacteria naturally occurring on our skin, on our vegetables and in the air that surrounds us to do their transformational work, for these fermented beets I opt for a salt-free method which strengthens both their rugged sourness and crude sweetness without the briny flavor that is so characteristic of fermented foods. The use of a starter culture such as probiotic-rich whey drawn off of raw milk yogurt, milk kefir or clabber, reduces the need for salt in fermented foods. While fresh whey functions beautifully in many fermented foods, I find that vegetable starter culture which you can purchase online produces particularly successful and reliable results, especially among salt-free ferments like the recipe for fermented beets below. Fermented beets are a traditional food of eastern Europe. In this recipe for fermented beets, we pair the classic root vegetable with ginger and orange. Dissolve vegetable starter culture into one-half cup filtered water and whisk in honey until the honey is thoroughly incorporated into the water. Allow the starter to sit at room temperature for about five minutes while you prepare the remaining ingredients. Toss together beets, ginger, orange zest and pickling spice together in a mixing bowl. Layer this mixture into a mason jar. Cover beets with the starter culture, adding filtered water, if needed, to completely submerge them beneath the liquid. Weigh the beets down, if necessary, so they rest below the level of liquid and allow them to ferment at room temperature for three to seven days before transferring to the refrigerator. just a silly question; are the beets raw or cooked? This recipe intrigues me. Great site! So happy to find…… excellent! What pickling spice do you use or do you make your own? Can I use raw, unpasturized apple cider vinegar instead of whey or buying a culture? It would be much easier and cheaper for me? No – a teeny bit of vinegar is okay in a ferment, but using vinegar in place of starter culture in this recipe would inhibit the growth of beneficial bacteria. How about refrigeration? Is that required once the process is completed? You can transfer to cold storage/fridge once it’s done fermenting to your liking. Can you tell me how to ferment/pickle the beets using raw milk kefir instead of the vegetable starter culture? I don’t recommend using kefir instead of vegetable starter culture in this recipe, unless you also choose to use salt in the ferment. In which case use 1/4 cup whey from your kefir and 2 tbsps sea salt. Could Water Kefir be used in the same way? 1/4 C Water Kefir + 2 Tbsp Salt? Doesn’t honey have natural anti-microbial properties? Wouldn’t organic cane sugar be a better choice? was cheking out your link re: starter culture but it seems to be dead – I realise it is an affiliate link so could it be it just has expired and you need to renew? Anyhow, I suspect also that it probably would link to a sale in US? As I am unlikely to order from overseas (delivery costs are just silly sometimes!) I was just wondering if you think that I could simply use some lacto-fermented brine from a batch of Kimchi I’ve just made to get the beet started? Great blog by the way! I made this beautiful recipe with starter culture. This is the seventh day and I am putting it in the refrigerator. Now, I can eat the beets . Can I drink the liquid (kvass) as well? Can i reserves some beets and kvass and repeat this process? I love your recipe it smells so good. Thanks…I am very new at fermenting and love your site! Any idea how many pounds is equal to the 6 medium? I want to make sure they will fit in the jar. Did you use the Caldwell or Body Ecology starter or does it matter? Sorry for the silly questions…I am new at this. I have read that a lot of people seem to have trouble with beets for some reason…not sure why. A bit off topic but where did you find the glass weights tht you use to hold the veggies down? I can’t seem to locate one that will fit into a mason jar or at least one that is safe for food. you can use a cloth or even put on the lid just don’t tighten it – that’s what I usually do & it turns out great. I was just wondering if one can use a starter such as kombucha to create the right environment for fermenting beets or other vegetables? I am currently brewing the tea, which is almost ready and I have a lot of beets to process and wanted to combine the two. Kombucha also consumes the sugars which creates the “baby” from the “mother” in the tea. It looks like a mushroom, but is a SCOBY, so technically, it should work, right? Don’t use kombucha. Different type of ferment that requires oxygen. This one should be anaerobic, no oxygen. The best way to ferment is with salt in a pickl-it or Harsch crock. Esp. if you really want food to be loaded with probiotics. Other methods are hit or miss, which wastes a lot of time. Also, considering the antimicrobial properties of honey, I wonder if anyone knows whether using it could compromise the final product, if I use only salt, and don’t add any starter (either whey, or leftover sauerkraut juice)? I’ve done this a few ways. I’ve used whey, juice from kraut(my favorite, as all my kraut is naturally fermented, no starters) and allowed it to naturally ferment. for the latter I don’t mess with the skins too much and use locally grown, pesticide free beets. I usually pack them in tight and set a food safe ziplock bag filled with brine on top to keep the beets down, if nessesary. I’ve also used a clean rock from the river, scrubbed clean and boiled. I don’t see why you couldn’t use milk kefir whey for this, but I don’t see water kefir working very well. I could be wrong. By the way, this site is fantastic! how would one use this to pickle eggs with? trying to get creative with getting some probiotic goodies in my husband’s belly. I tried this recipe and it was ok, but we didn’t like the raw beets. Would it be ok to cook them first? Also adding more honey to make them a sweet beet? I started the beets 8 days ago, and used whey and two tablespoons sea salt. On Day 5, the beets were quite hard so I melted down some coarse salt and added it. On Day 8, the beets are still quite hard. Could I add kraut juice? How long can these be stored in the fridge? What is the best long term storage solution? I usually can pickled beets and pressure can peeled beets……I would like to replace my home canned vegetables with fermented vegetables but I’m uncertain on long term storage options. Thank you. Properly fermented, they should store for 2+ years in the refrigerator. If space is concerned, consider a cool basement, root cellar or garage. Hope that helps! All of my beets turned brown. Is this normal? There we a few that were sticking out of the top. I thought I’d remove them once the batch was done, but I’m wondering if they made the whole batch go bad? That isn’t normal. Hmmm … what color were the beets when you started out? It’s been a little warm here. Maybe 7 days was too long. Sorry I’m a little late here, but mine turned a brownish-red color. I think the color is just leeching out of them, they taste fine and there’s no mold. I used salt instead of the vegetable starter. I am new to lacto-fermentation (and to cooking blogs in general) and am under the impression that adding salt to a ferment helps prevent the formation of mold. Can I still add salt to this ferment even if using a starter culture? Or is it more a case of using one or the other? Love your site – so inspiring! Hello. I live in a remote area where getting a vegetable starter culture is not possible. Your recipe sounds amazing. Will it work if I would to use boiled water and salt instead of the vegetable starter culture?? Please help. Hi Jenny. I am all set to make these but after reading all the issues think I’ll just take Sally’s fermented beet recipe in NT, which I have made before with success, and tweak it with your spices. I like the idea of cooking the beets first, but you do them raw. perhaps I’ll experiment and do one of each. I shall report back…. How much salt per cups of water would you do if you were to only use salt method to ferment the beets? I have been fermenting for quite some time but have never done beets. Do the beets in this recipe soften? Also have never cultured without at least some salt. Hi there, my pickling spices won’t stay submerged under the weights. Is this a problem? Thank you in advance! Hi My husband can’t have honey or cane sugar…would I be able to sub coconut sugar or something instead? Is any lid needed? All that is required is to keep the beets submerged? You have a wonderfull website and very interesting! I am just starting with fermenting foods, i love it. Why we need a vegetable culture in this recipe, will it not work without, just a brine? I don’t know where i can find it where i live (Belgium). You can do this with just brine if you like! You may need to ferment it a touch longer, though. Did u cook these beers in order to pull skin off? You do not indicate how much vegatble starter culture to use in the beet recipe for FERMENTED BEETS WITH GINGER AND ORANGE. I guess you must mean one package of starter. Can you use whey as a starter in this recipe? If so how much? Also, what size jar is needed for this recipe? Lastly, can I cut the beets into thicker matchsticks rather than rounds? I used just whey and the liquid is very thick, I am 4 days in and mildly alarmed, but I do not see signs of mold. It seems like there’s fermentation, there is flakiness that I recognize from making kvass. Do you think my beets may be unsafe to eat? Where do you find the pickling spice…or if you make your own, what are the quantities of each, please 🙂 Also…finding an organic orange could be interesting. After transferring beets to the refrigerator; how long should you leave there before eating. In all, how long do you wait before eating? You don’t need to wait to eat a ferment that has achieved the level of sourness you like. Thanks for the recipe–I’m really looking forward to trying this. I like that no salt is required, since we are a no-salt family. I am curious as to whether water kefir could be used as the starter culture? If I were to use water kefir, I would also omit the honey since there would be sugar remaining in the kefir. I don’t have a “vegetable starter culture”. How do I complete this recipe with salt or with whey? I do not have starter culture. Please advise. how can I make myself a vegetable starter culture? It´s the first time I hear of that. I´m a Paraguayan(South America) and we have not here such things. So, what do need to make my self vegetable starter culture. Don´t worry about microbiological terminology, because I´m a Veternarian. Vegetable starter culture is a commercial, packaged product and is not something you can make at home; however, you can make a wild-fermented sauerkraut, and save some of the brine when it is finished fermenting. Use that instead of a commercial, packaged starter. I happen to have some whey from yogurt making I did yesterday. Can I substitute my whey for the vegetable starter? How much should I use? Would it work to use kombucha liquid in place of whey or veggie starter culture? you boil your beets first before peeling? No. That would be specified in the instructions.